SSAI is one of the crucial innovations that has allowed over-the-top (OTT) video to become a viable industry, because it opens up paths to monetization and helps to both absorb infrastructure costs and create profit centers where cost centers have existed. But while technologists are bullish on SSAI, some vendors and content publishers are a bit more cautious. This article takes a look at the state of SSAI, both its successes and the challenges it still faces, including scaling to large audiences and privacy concerns. According to a recent Interactive Advertising Bureau study called “Live Video Streaming: A Global Perspective,” 70 percent of consumers watch digital video once a day, 67 percent have live streamed content, and more than half (52 percent) prefer free, ad-supported content. Stream stitching and SSAI allow ads to be inserted directly into the programming stream, making for a more seamless viewing experience. And if SSAI makes viewers happy, it’s making content publishers and distributors even happier. “The move to SSAI has opened up significant live and linear OTT inventory,” says Allen Klosowski, senior vice-president of the advanced solutions group at ad serving platform SpotX. SSAI has simplified video on demand (VOD) as well, because the same technology can be deployed across all media assets. “This has quickly driven scale in multi-platform distribution and monetization for our clients,” he says. “SSAI seamlessly inserts ads into streaming video content, allowing monetization on any device that can play video,” says Andrew Broadstone, director of product management at Brightcove. SSAI works with both Live or VOD and is really the only way to have live advertising (more on that later). Previously, ad stitching came about because of device fragmentation in which some viewing devices lacked client-side capabilities. 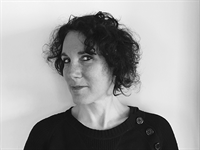 The crux of the problem is that most current ad technologies, including programmatic trading, viewability, measurement, and interactivity, were first created for the client-side ad serving and weren’t supported by SSAI. This is no longer true. SSAI creates an individualized media stream for each unique viewer, in which different viewers get different ads. 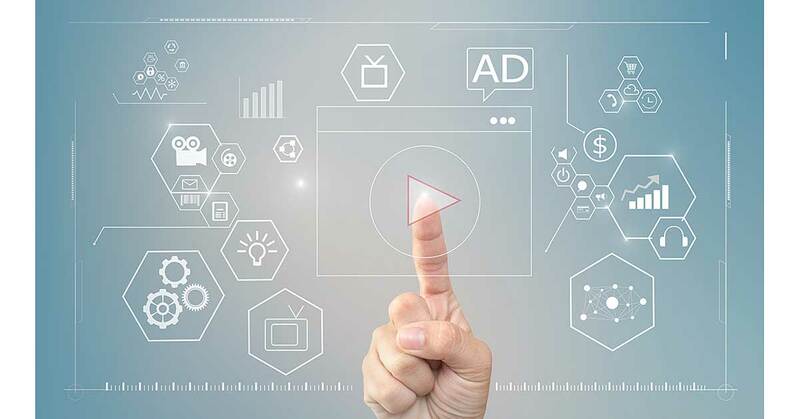 The ad break communicates with an ad decision server, which decides what to serve each particular viewer, based on information such as viewing history, demographics, and geographical location. All of this takes places on the server side. 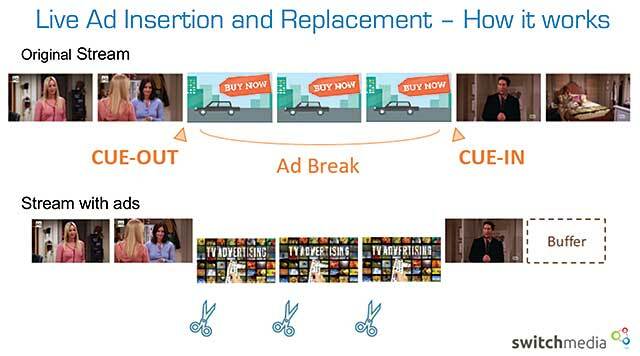 A simple graphic breakdown showing how TV ads in the original broadcast stream (top) are replaced by different ads in the individually targeted stream (bottom). Image courtesy Switch Media. “Ad blockers work by detecting ad calls that are made in the client. However, with server-side stitching, the ad call and ad stitching are performed before the stream reaches the client, meaning the ad blocker doesn’t detect an ad call and therefore is unable to block the response,” says David Springall, founder and CTO of Yospace, which provides server-side dynamic ad insertion for live and VOD streaming. Preventing ad blocking is one benefit of SSAI, since the stream can’t be detected as coming from a known ad-serving URL. Another benefit is being able to replace and personalize ads already embedded in a stream. Magnus Svensson, media solution consultant at Eyevinn Technology, helped Bonnier Broadcasting, MTG, Discovery Networks Nordics, and Telia Co. develop a technical specification for SSAI. The broadcasters were not able to monetize online streams when distributed by an operator, since it was sending out content with the original broadcast ads with no ability to measure ad views. To start selling online advertising, they needed to make changes in the distribution workflows. “The trend in the Nordic region and in Europe now is definitely moving away from client going to server side,” Svensson says. Svensson says he spent an equal amount of time addressing data privacy as he did the technical requirements to implement SSAI. Telia is now able to offer ad personalization and frequency capping while anonymizing data to follow new General Data Protection Regulation (GDPR) guidelines. Telia is targeting based on approximate geographic area (since the exact area is considered personally identifiable information), content, screen size, and device type. The specification document can be found online. The fear of leaving ad dollars on the table was enough motivation to get the Scandinavian groups to work together. So what are the technical issues that anyone implementing SSAI needs to look at? The first step is identifying how the video player knows what’s an ad and what is content. Broadcast content generally has a SCTE (Society of Cable Telecommunications Engineers) marker embedded as part of the stream, which includes information about when an ad break starts and how long it is. Traditional broadcast has two types of SCTE markers—104 for baseband (HD-SDI) and 35 for IP video. These markers are “read” and translated to OSMF cuepoint messages that are passed between server and player for content/ad stitching via discontinuity signals. But not all content has SCTE markers. In order to support SSAI, the client needs to be able to handle HLS DISCONTINUITY tags or MPEG-DASH manifests containing multiple periods. In SSAI, you don’t start and stop a stream as you do in client-side ad insertion (CSAI). Instead, the segments are delivered in a continuous stream server-side, with ad segments stitched into the manifest. DISCONTINUITY tags (or, for MPEG-DASH, multiple periods) are used to inform the player that the upcoming segments have different characteristics. The presentation time stamp (PTS) reset is one clear example; changes in frame rate end encoding are other differences that might occur between the original video and the ad segments. The packager chunks the video stream into encrypted video file segments according to the different DRM systems and also creates the streaming format manifests. “To signal where an ad break start and ends in the case of HLS it can use the tags EXT-X-CUE-OUT and EXT-X-CUE-IN, and for MPEG DASH it creates a new period,” Birmé notes. “The SSAI component then fetches the HLS-and MPEG DASH-streams from the origin and parses the streaming format manifests to be able to create a personalized and unique virtual stream for the viewer. The virtual streams also contain the necessary information that the DRM decryption module needs to be able to acquire a license from the DRM system. 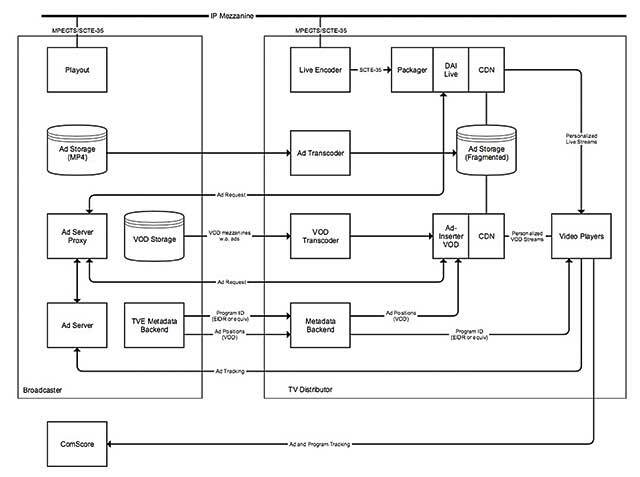 A schematic showing the SSAI specification adopted by Bonnier Broadcasting, MTG, Discovery Networks Nordics, and Telia company. “The trend in the Nordic region and in Europe now is definitely moving away from client [and] going to server side,” says Magnus Svensson of Eyevinn Technology, which helped develop the specification. Click for a larger version. Image courtesy Eyevinn. 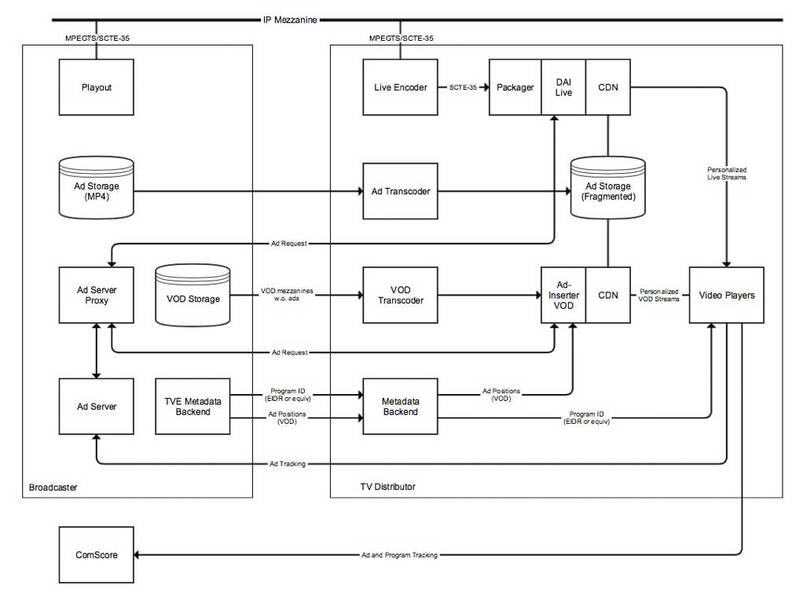 Every video publisher and distributor will have unique requirements when it comes to SSAI, and not all applications support SCTE markers. “I work at a media company and we have rules about users not being able to skip ads, not playing an ad more than once, and requirements to do third-party tracking of ad playback. That means that there are components in our player that need to know exactly when an ad is on the screen so that seeking can be disabled in the UI and video click-through can be passed to advertiser’s web sites,” says Xiques. “There’s no standard way of interpreting SCTE-35 markers on the 15 different application platforms that I support.